I drive a mini van but I've never been a soccer mom in the literal sense of the term. Soccer remains one of the few sports I haven't tried. In fact, I've never watched a game, and I don't even understand the basics of the sport. And even though I saw the World Cup opening ceremony concert on TV, I haven't watched any of the games this year. I'm sure many people will be watching today as the U.S. faces Ghana in the Round 16 World Cup match. Perhaps today is a good day for me to start paying more attention. My daughter decided to join our local preschool team this summer, so it looks like my non soccer mom status may be a thing of the past. It's time for me to learn more about the sport! My kids probably won't want to watch today's World Cup game, but thanks to Disney, this week they had the chance to watch a soccer movie starring that amazing, athletic Golden Retriever in the newly released Air Bud: World Pup Special Edition DVD . 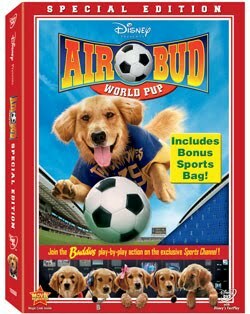 Originally released in 2000, Air Bud: World Pup is the third Air Bud movie in the Disney series. This new special edition released on June 15, 2010. Buddy the dog and his owner Josh try out the game of soccer in this Air Bud flick and romance is in the air for all the main characters. Josh's mom gets married, Josh becomes interested in his female soccer teammate named Emma, and Buddy falls for Emma's dog Molly. The movie is a lot like 101 Dalmatians in the respect that Buddy and Molly have puppies and two dog catchers try to steal the puppies. In the end of the movie, Buddy gets the chance to play in a Women's World Cup Soccer game. (I'm still trying to figure out why a male dog gets to play on the women's team.) The movie features the same silly humor and slapstick comedy as the first two Air Bud movies, so kids that enjoy Air Bud will probably also like watching this one as well. My daughter spend a lot of time oohing and ahhing over the puppies in this film. They are pretty cute. This new edition released at the perfect time -- all World Cup soccer fans just might want check out Buddy's moves. The soccer-playing dog is pretty impressive! The bonus features include a soccer edition of the Buddies Sport Channel. Rosebud, Budderball, Mudbud, B-Dawg and Bud-dha provide a recap by of Buddy's soccer career. There's also a "Making Of Air Bud World Pup Production" featurette. The special edition version comes with a very small, child-sized Sport Cinch Bag. Sounds like a fun movie! My kids love dogs... Netflix here we come! We love all of the airbud movies! Any movie with a dog as the main character catches my girls' attention right away. Great review. ps. GO Soccer Mom!!! and good luck to your little one with her new sport! I haven't watched this movie, but I've been watching the World Cup. This is my favorite tournament of all sports.